Berg’s latest, Patriots Day, is certainly no exception, this tension-fueled drama looking at the Boston Marathon bombing, a crushing attack that took place on American soil. On April 15th, 2013, a brutal act of terror devastated the lives of many when two homemade explosive devices went off at the annual Boston Marathon’s finish line at around about 2:50pm, killing three (including an 8-year-old boy) and injuring 264, this tragedy testing the very fabric of Boston as a people — the shattered community banding together, displaying incredible strength, resilience and resolve, by rising from the ashes to aid authorities in identifying and locating the whereabouts the cowardly culprits. Boston. A city of heroes. 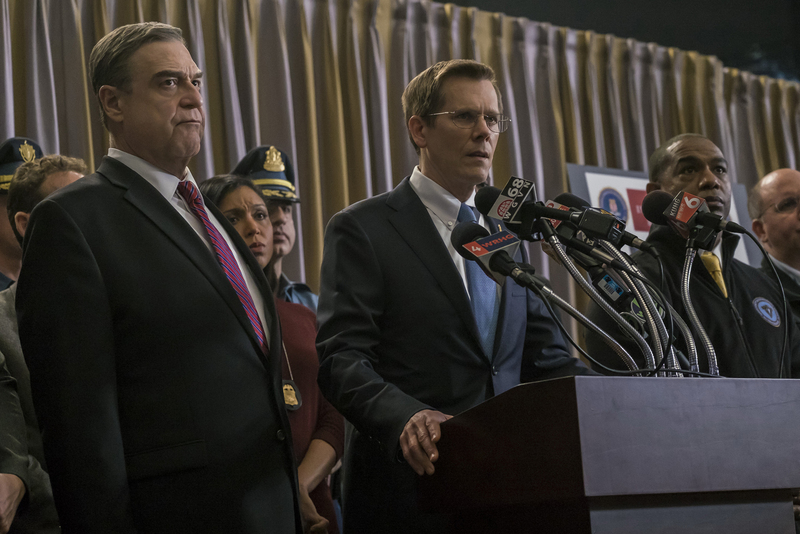 A tale about civic heroism, Patriots Day recounts the events leading up to the vicious strike and what took place directly after, the narrative interweaving a handful of stories from actual survivors, first-hand responders, hospital staff, law enforcement personnel and government bureaucrats, the movie opening up mere hours before the running of the marathon and concluding at the tail end of the subsequent four-day manhunt, which saw the city of Boston shut down — an unprecedented occurrence in recent US history — until the men responsible were finally brought to justice. Based primarily on a 60 Minutes interview which focused heavily on Boston Police Commissioner Ed Davis (played here by John Goodman) whilst drawing on a variety of other sources and testimonials, including interviews from actual victims and eye witnesses, the screenplay, penned by director Berg, Matt Cook, Triple 9 (2016), and Joshua Zetumer, RoboCop (2014) — adapted from a story written by Berg and Cook, along with Paul Tamasy and Eric Johnson — generally sticks to facts and details, director Berg having chosen to take an arms length approach to the material; and for this, the film truly benefits. Having somewhat mastered the ‘true-to life’ pic formula (particularly those about valor and everyday heroics), Patriots Day is Berg’s most honest, raw and visually refined feature to date, the veteran filmmaker accepting the idea that, more often than not, truth hits harder than fiction. Integrating video footage into gritty Hollywood-style set pieces, Patriots Day looks and feels authentic with goings-on, at times, even assuming a quasi-documentary-like quality; production designer Tom Duffield, Hell or High Water (2016), should really be commended for his outstanding location re-creations and attention to detail, with some of the movie even shot on site — in several streets and areas surrounding the actual blast. From that ugly third Monday in April (a day that many would prefer to forget), to the hunt for the perpetrators (two narcissistic religious radicals) and the relentless on-the-ground pursuit that resulted, the narrative races through key events in the diminutive timeline with a vast sense of urgency, all of this playing out in a credible and convincing manner. 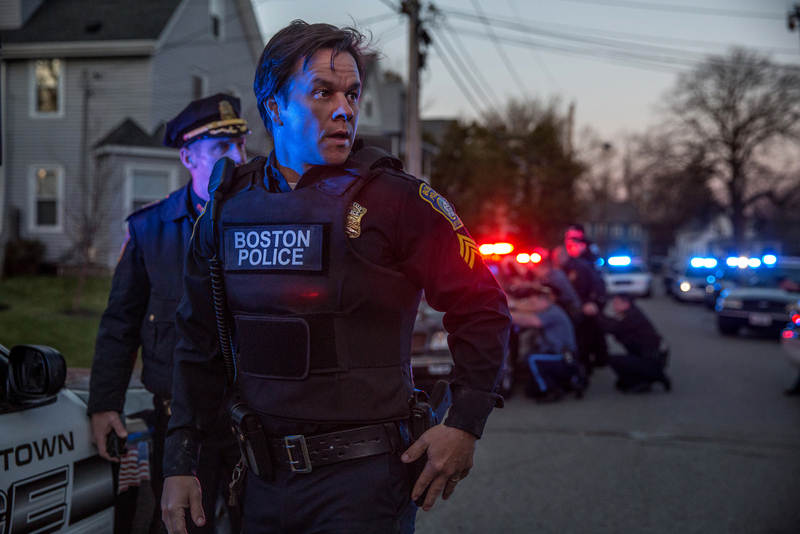 Truth be told, I didn’t know many of the ins-and-outs surrounding the incident (outside of the explosions themselves), but what Patriots Day does exceptionally well is present each of the characters’ individual scenarios (or accounts) exhaustively, allowing the audience to connect the dots and make links as the crisis unfolds up on screen. Heck, the fierce confrontation between the cops and terrorists on the streets of Watertown — turning the peaceful neighborhood into something of a warzone — is an incident I was actually unaware of, this scene (and many others like it) all part of a stirringly grafted larger mosaic, one that works as a fitting tribute to the real-life heroes that emerged in the aftermath of this unspeakable atrocity. A bona fide ensemble piece, the movie also stars a plethora of talented actors, all of whom deliver powerful performances. Exemplifying America’s steely values is lieutenant Tommy Saunders, played by the reliable Mark Wahlberg (who’s a producer on the film, too), Saunders being a fictionalized local policeman who’s been written into proceedings for plotting purposes, the guy’s can-do attitude embodying Boston relentless fighting spirit — the character a composite of the many heroes that couldn’t be squeezed into the film’s two-hour plus runtime — Saunders, recovering from a prior leg injury, still determined to lend a hand both on the scene and during the investigation that followed. Michelle Monaghan, Source Code (2011), plays Tommy’s wife, Carol, who serves as emotional support for her fatigued husband, Carol symbolic of the many ‘significant others’ working behind the scenes as pillars of strength for their law enforcement partners. The clock is ticking. The world is watching. John Goodman, 10 Cloverfield (2016), is excellent as larger-than-life Boston Police Commissioner Ed Davis, just one of the many men heading the nerve-wracking capture operation, the 64-year old Goodman baring a striking resemblance to the modest and committed Davis, whereas Kevin Bacon, Mystic River (2003), brings weight and gravitas to the authoritarian role of FBI Special Agent Richard DesLauriers, another major figure at the forefront of the inquiry. Rounding off the boys in blue is J.K. Simmons, Whiplash (2014), who portrays small-time Watertown Sergeant Jeffrey Pugliese, the esteemed police officer still serving in the same unit today. Further humanizing the narrative, which often plays out like a fast-paced police procedural, are Christopher O’Shea (a relative newcomer to feature films) and Rachel Brosnahan, Beautiful Creatures (2013), who personify Patrick Downes and Jessica Kensky, a young couple going about their daily routine, the duo choosing to casually head down to the world-renowned marathon to cheer on the athletes — this decision forever altering their lives. Honoring the real-life sufferers, O’Shea and Brosnahan convey the pair’s traumatic story with genuine positivity, their scenes together hammering home the film’s chief message, Patriots Day a movie about hope and human fortitude as opposed to the malevolence of man. On evil, the film’s antagonists, two twentysomething Chechen-American brothers, Dzhokhar Tsarnaev (a simple University student at the time) and his sibling Tamerlan, are played convincingly by Alex Wolff, My Big Fat Greek Wedding 2 (2016) — who’s cast against type here — and Themo Melikidze, Beautiful Something (2015), the movie briefly examining the confused headspace of these psychopaths (men motivated by extremist Islamic beliefs), filmmakers ensuring that the presence of these violent zealots — whose eventual plan was to travel to New York City to bomb Times Square — doesn’t overshadow the underlining optimism at the heart of the story. In addition, a standout sequence between Tsarnaev’s wife, Katherine Russell, played by Melissa Benoist, Whiplash (2014), and an unnamed police interrogator further illustrates the terrorists’ immense disillusionment. Lastly, actor-comedian Jimmy O. Yang, Silicon Valley (2014), almost steals the show as Dun ‘Danny’ Meng, a 26-year-old Chinese emigrant held hostage inside of his own vehicle (a Mercedes-Benz SUV) when it’s carjacked by the suspected terrorists, Yang rendering Meng’s frightening encounter with unnerving dread and audacity, his moment of truth just one of many applause worthy scenes! 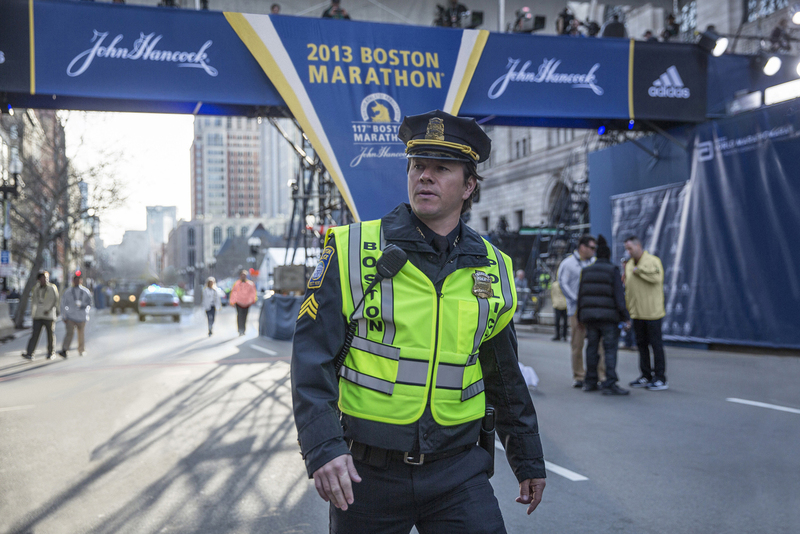 After the race has been run and won, one can ultimately debate whether the release of Patriots Day was ‘too much, too soon,’ the bombing itself taking place only 4 short years ago. 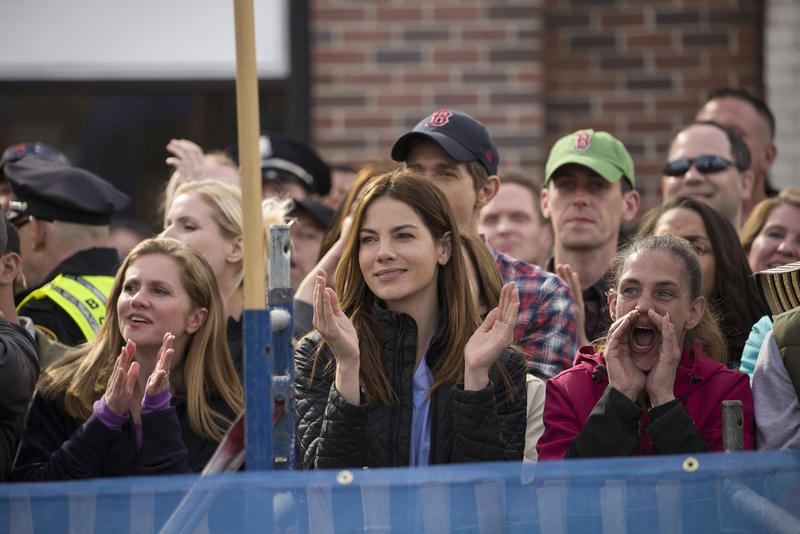 But the encouraging statements put forward by actual heroes and victims, seen at the movie’s close, convey its rousing message hard and clear, the resounding reaction from all persons involved truly ‘superhuman.’ Gripping and heartfelt, an utterly visceral, edge-of-your-seat experience, Patriots Day is a film that’s not to be missed, its significance perhaps more prominent today than even before.